(Gainesville, Florida) - There’s something different in the Florida air this summer. A new Bull Gator rules The Swamp and Gator Nation has taken note. After a sweeping tour of Gator Clubs throughout The Sunshine State, Gator fans have found a unifying reason to praise their already legendary Coach. 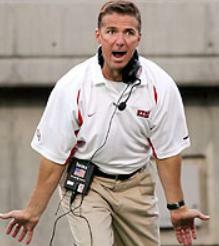 Coach Meyer’s current record at Florida is 0-0. The Magical Mystery Meyer tour has roared through the state this summer with standing room only crowds. At the Hernado Gator Club, former Gator player Emmitt Collinsworthfell could barely contain his enthusiasm. When asked what “it” is—Collinsworthfell responded he wasn’t exactly sure but the pictures sure did look good. What should the college football world make of all this? Are Florida fans desperate because of their lack of any substantive football tradition? Is the presence of Steve Spurrier at South Carolina causing Gators everywhere to schizophrenically cling to Meyer for dear life? Is this hyperbolic excitement a symptom of trying to forget Ron Zook? 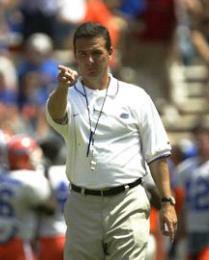 And does all this staring and pointing necessarily translate into victories for the Gators? Coach Meyer was gracious enough to take time out of his busy schedule to give this reporter some time. 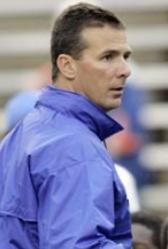 When asked via phone about his biggest coaching influence, Meyer gave credit where credit is due. “Coach Bob Davie, definitely. He’s been the biggest influence. You just learn so much working for Coach Davie. You see, he learned a lot from Coach Holtz and both knew there’s a lot more to coaching than preparation, tough conference schedules, and X’s and O’s. 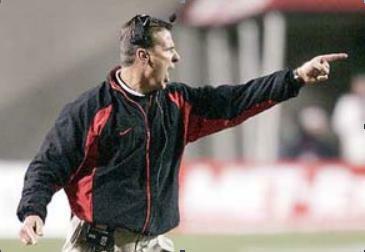 When asked if demanding respect included his famous staring and pointing Coach Meyer declined to comment. What will become of The Bright Shinning Light from the Sunshine State? Is it more light than heat? A lot of hype? A solid foundation for Gator hopes? This important news bulletin was proudly brought to you by the Georgia Football Dawg Blog. 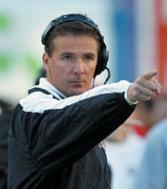 Maybe he is pointing and staring at his national championship trophy.